Our ISOE-EWI SEALING SYSTEM contains all the sealing components required for the simple and secure connection of external thermal insulation composite systems (EWI) to building openings and projections. It is has been optimised particularly for the straightforward, secure and fast connection of EWI elements to windows and doors as well as in the roof and base areas, thus enabling you to meet all structural-physical requirements professionally without any problems at all. ISO-BLOCO 600 “PREMIUM EDITION“ or ISO-MEMBRA SX are the ideal choice for the long-term sealing and refurbishing of external wall joints in thermal insulation composite systems. Both system products are suitable for sealing the vertical joints between the EWI elements and the facade substrate against driving rain. With ISO-BLOCO 600 “COLOUR EDITION“ you have the ability to match the colour of the connection joint. The special membranes ISO-CONNECT VARIO XD and ISO-CONNECT OUTSIDE EPDM guarantee the seal under the window cill profiles, leaving surface water and condensation no chance of damaging the thermally insulated facade. 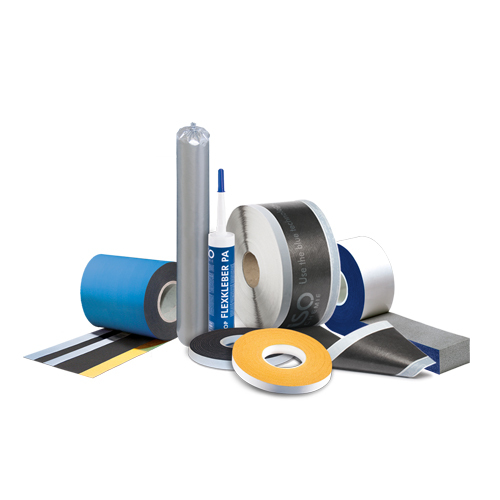 To complement these products, there are matching adhesive and sealing products available from our range to bond the foils in place, thus guaranteeing a long-term seal. See the relevant product pages for more details.